The glycosylation systems of Campylobacter jejuni (C. jejuni) are considered archetypal examples of both N- and O-linked glycosylations in the field of bacterial glycosylation. 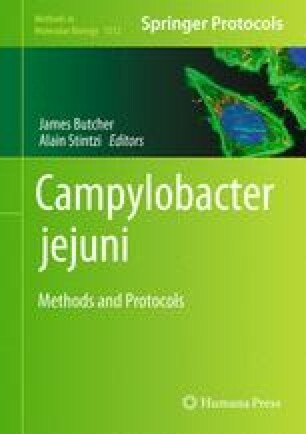 The discovery and characterization of these systems both have revealed important biological insight into C. jejuni and have led to the refinement and enhancement of methodologies to characterize bacterial glycosylation. In general, mass spectrometry-based characterization has become the preferred methodology for the study of C. jejuni glycosylation because of its speed, sensitivity, and ability to enable both qualitative and quantitative assessments of glycosylation events. In these experiments the generation of insightful data requires the careful selection of experimental approaches and mass spectrometry (MS) instrumentation. As such, it is essential to have a deep understanding of the technologies and approaches used for characterization of glycosylation events. Here we describe protocols for the initial characterization of C. jejuni glycoproteins using protein-/peptide-centric approaches and discuss considerations that can enhance the generation of insightful data. I would like to thank Beverley and Meowcroft Phillips for their tireless support and proofreading of this manuscript. N.E.S. is supported by a National Health and Medical Research Council (NHMRC) of Australia Overseas (Biomedical) Early Career Fellowship (APP1037373) and a Michael Smith Foundation for Health Research Trainee Postdoctoral Fellowship (award # 5363).